This beautiful image shows the beautiful open star cluster NGC 7380, also known as the Wizard Nebula. A pair of spooky and spectacular celestial sights are showcased in two new photos, just in time for Halloween. One new image, from the University of Arizona's Mt. Lemmon SkyCenter (MLSC), depicts the dazzling Wizard Nebula, which surrounds an open star cluster 8,000 light-years from Earth called NGC 7380. The Wizard Nebula lies in the direction of the constellation Cepheus and can be seen with a small telescope. 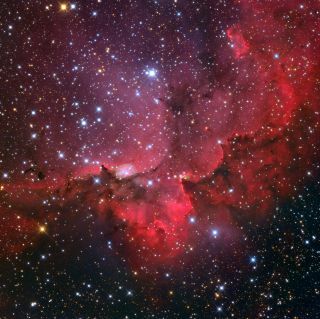 "The active star-forming region spans about 100 light-years, making it appear larger than the angular extent of the moon," NASA officials wrote in a description of the nebula and NGC 7380 two years ago. "Although the nebula may last only a few million years, some of the stars being formed may outlive our sun." Just in time for Halloween, astrophotographer Fred Herrmann sent in a photo of the "Witch's Broom," NGC 6960, part of the Veil Nebula. Herrmann took the photo from his observatory, Owl Mountain Observatory on Blue Mountain in Huntsville, Alabama. Photo dated 2013. The other image, taken by astrophotographer Fred Herrmann, captures the stunning nebula NGC 6960, dubbed the "Witch's Broom." It's part of the Veil Nebula supernova remnant, which was created when a massive star exploded about 9,000 years ago. "Today this large (36 times the area of the full moon) but dim remnant is only visible using a telescope and sensitive electronics," Herrmann told SPACE.com via email. "The 'Witch’s Broom' portion of the Veil spans about 35 light-years and is about 1,500 light-years distant in the constellation Cygnus. The bright star at its center is 52 Cygni. Although this star appears very bright in the image, it is only visible with the unaided eye from a dark location." Editor's note: If you snap an amazing picture of any night sky view that you'd like to share for a possible story or image gallery, send photos, comments and your name and location to managing editor Tariq Malik at spacephotos@space.com.